Not sure which edition is right for you? Amazon’s growing dominance in online retail has required brands to completely re-evaluate their relationship to the marketplace giant. Historically brands viewed Amazon as just another sales channel that could be operated similarly to other distribution channels. At Sellics we realized early on that selling to Amazon would not be like other channels, and to succeed on Amazon you would have to play by Amazon’s rules. Success on Amazon would require an Amazon strategy, and for the bigger brands, most likely a dedicated team tasked with managing sales growth and operational challenges on the marketplace. Interestingly, when we launched in 2014, it was not the established brands but rather third-party (3P) marketplace sellers who first recognized the need for a dedicated Amazon strategy, personnel and software. It was only recently that we started to receive an influx of requests from Amazon vendors asking us if Sellics can also be used for their Amazon operations. Global brands are now increasingly aware they need an Amazon strategy. However many are at a loss of how to get started, and struggle to identify the tools they need to drive sales growth and ensure their Amazon operations run smoothly. Account managers and marketers struggle to navigate the Vendor Central platform, which offers limited functionality in terms of managing product assortment, brand reputation, Amazon search marketing (‘Amazon SEO’), and running profitable Amazon ads on the AMS platform. At Sellics we understand very well the unique challenges vendors face on Amazon. 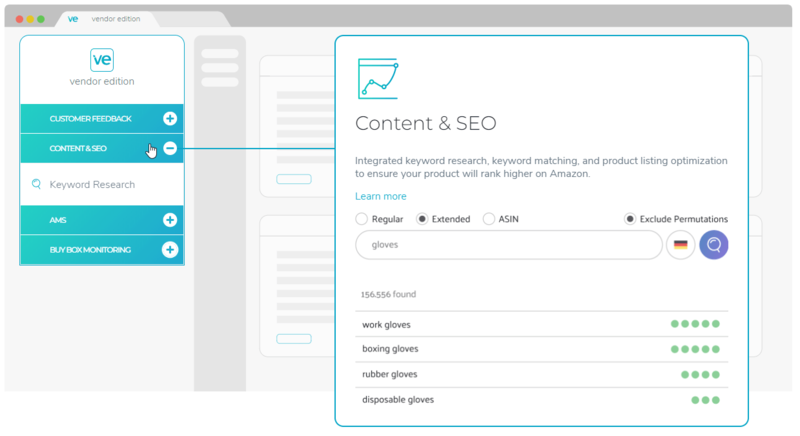 Last year we made the decision to build an entirely new software platform for Amazon vendors, to equip vendors with the tools we recognize they needed to scale their success on Amazon. We released an early version of our Vendor Edition last year, and were extremely gratified by the overwhelming interest from vendors. Our enterprise clients include Lego and Bosch, who use our Vendor Edition software to scale their Amazon operations. We’re extremely proud to have hundreds of brands using the Sellics Vendor Edition today, and have worked hard to innovate and improve our software features based on the feedback our clients have given us. If your brand is interested in using Sellics, you can reach out to us for a free demo of our Vendor Edition software. Try Sellics for free now! Which Sellics Amazon Software Edition Should I Use? Founder and CEO of Sellics - a powerful All-in-One tool that combines everything sellers need to be successful on Amazon.